In this tense and brilliant tale from the national bestselling author of The Death of Bees, a young boy on a small Scottish island, where everyone knows everything about everyone else, discovers that a secret can be a dangerous thing. Eleven-year-old Michael Murray is the best at two things: hacky sack and keeping secrets. His family thinks he's too young to hear grown-up stuff, but he listens at doors—it's the only way to find out anything. And Michael's heard a secret, one that may explain the bruises on his mother's face. When the whispers at home and on the street become too loud to ignore, Michael begins to wonder if there is an even bigger secret he doesn't know about. Scared of what might happen if anyone finds out, and desperate for life to return to normal, Michael sets out to piece together the truth. But he also has to prepare for the upcoming talent show, keep an eye out for Dirty Alice—his archnemesis from down the street—and avoid eating Granny's watery stew. 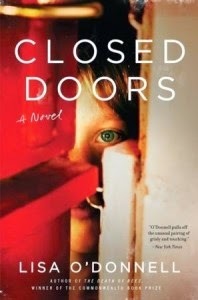 Closed Doors is the startling new novel from Lisa O'Donnell, the acclaimed author of The Death of Bees. It is a vivid evocation of the fears and freedoms of childhood and a powerful tale of love, of the loss of innocence, and of the importance of family in difficult times. Closed Doors by Lisa O'Donnell is a very highly recommended novel which focuses on a certain time period of a family in crisis. Michael Murray is the narrator of Closed Doors. He is eleven years old and lives on a small Scottish island with his parents and his grandmother. Michael astutely describes his mother and life on the island "Everyone says Ma is very smart and could have gone to university or something like it, but she was too in love with my da and mad for the island, even though people here gossip all the time and want to know all your business. It makes my granny crazy, even though she gossips all the time and wants to know everyone’s business.“ (Location 109) So it's like any small town anywhere. Set in the 1980's, Michael is, perhaps, a bit more naive than those his age might be today. Adult readers will know what has really happened and will understand that Michael suspects more has happened than he has been told so he must figure out the truth from his limited knowledge. In an attempt to try to make some sense of his world Michael discovers what is going on and what his parents and others are saying by eavesdropping - listening behind the closed doors. Lisa O'Donnell is a fantastic writer and manages to capture the voice and thoughts of Michael perfectly. Even when he turns to a dictionary to make sense of what he has been told, it is clearly what a child would do during that time in history. (Today they'd google those same words.) Children always hear and know more than adults/parents realize they do. O'Donnell succeeds in describing what Michael overhears, what he knows, and how he pieces the information together. He knows that his mother has changed. He wants their relationship to return to what it was; he wants her to love him like she used to, but also knows that they have both changed. I loved O'Donnell's first novel, The Death of Bees, and while I love Closed Doors a wee bit less, I still will easily give it my highest recommendation - very highly recommended. Lisa O'Donnell is certainly a writer to keep watching. She does an excellent job developing her characters and then slowly allowing the plot to develop. And Michael's right. It is "good to listen to your records when no one is looking." Lisa O'Donnell won the Orange Screenwriting Prize in 2000 for her screenplay The Wedding Gift. Her debut novel, The Death of Bees, was the winner of the 2013 Commonwealth Book Prize. She lives in Scotland. Disclosure: I received an advanced reading copy of this book from HarperCollins for review purposes.